While her client’s desired end goal was silver stands to match her natural hair, Melissa Grace Smith (@sweetmelissagrace) knew she wouldn’t be able to achieve that pure of a tone in one session thanks to years of box dye. 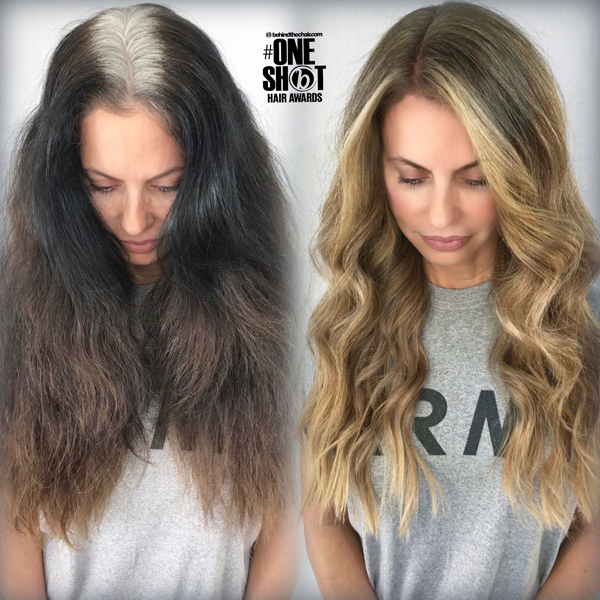 Since her client had such long locks, Melissa enlisted the help of Danielle Devine (@devine_blonde) and 8 hours later, they created this healthy honey blonde transition shade. Check out the color formulas and how-to steps below! 1. Paint a full babylight up to the line of demarcation with Formula A, only leaving out woven sections. In the last few sections, switch to Formula B. 2. Keep an eye on the hair while it processes. For this client, the darkest parts of the hair (toward the top of the head) started showing signs of distress once it reached a Level 7/8, so Melissa decided to remove the lightener and assess the color. 3. While removing the lightener, rub the formulas on to the woven sections to slightly lighten the hair that had not been highlighted yet. 4. Then, shampoo and tone with Formula C. Follow with the b3 Brazilian Bond Builder Demi Permanent Conditioner Kit to prep hair for a potential second round of lightening. 5. Blow-dry, then assess the hair. If it can’t withstand another round of babylights, instead apply Formula D to blend the roots with the rest of the hair. 6. Use Formula B to balayage a few pieces around the hairline, then rinse and style as desired. Want to see more color correction magic? Check out this brassy blonde to creamy vanilla transformation!